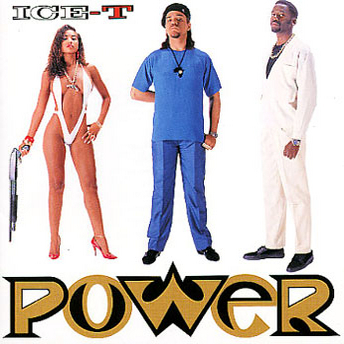 I dont know why I’m in an Ice T mood, but I want y’all to hear some Ice T. Classic cover for his second release POWER. So here are a couple videos and tracks from Tracy to rock in your ipod. And of course the Magnum Opus from the Ice man. Colors. Shouts to my mans DJ RON and DJ SHUSTA for the high quality link. Pick up that Boom Box Mixtape Vol 1 & 2. Say word fellas. They said the people wont wear high heels and high tops, but ladies and gentlemen we showed them all once again with a resounding bass thump, that…. First off. Thank You. Thank you all for checking back with the blog daily, for spreading the word to all your friends and for helping us kick off the first High Heels and Hi Tops with a bang. There nothing I like more than a packed party with a good vibe of everybody enjoying themselves. And on Saturday we definitely had that. The ladies definitely represented in some fine footwear, and the fellas came out and repped too. Big fat shouts to our homey Joe Russo, who was taking pics all night. Shout out to the HHHT squad, we held it down lovely on the music and microphone tip. We will be doing the next one at a bigger venue so that we can get everybody in next. Apologies if you didn’t get in. We got you next time. Here’s some kick love to start off the pics. This is why stars need PR people. He cited the mock interview the journalist did with Bow Wow and Omarion for the response given. So here we have yet another Blog to add to the huge blog-o-sphere out there. This one specifically caters to a new event that we will be holding once a month in and around Taipei City. As you can see from the title of the blog, the parties are about high heels and high tops. 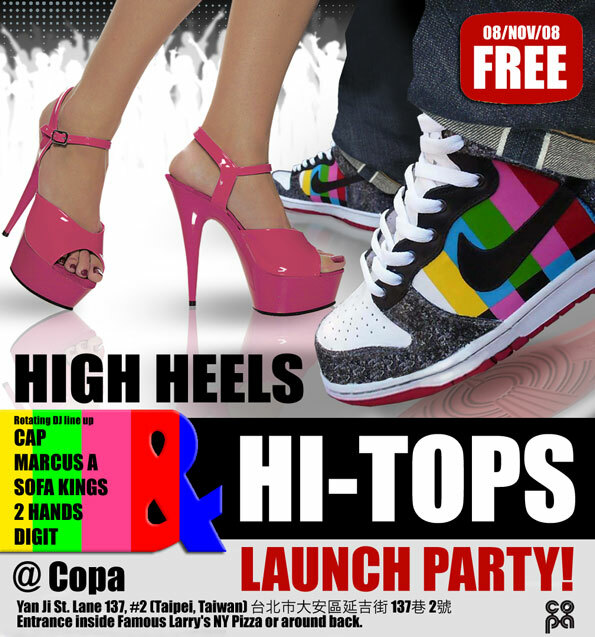 Its as simple as it sounds, ladies rock high heels, fellas rock a pair of high tops. Come out, hear some good tunes, party, have a good time and then come check the blog for pics. The first one kicks off on November 8th at Copa with musical duties being taken care of by Marcus Aurelius, CAP and The Sofa Kings. If you were at Copa for the ‘Secret Handshake’ then you know what to expect. However, this time there will be bottled beer, plastic cups and some more staff behind the bar. And did we mention that ITS FREE!!! Musically we have a rotating roster of 5 DJ’s. 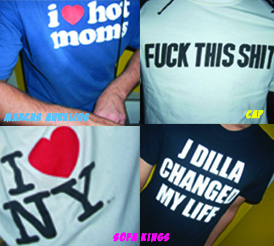 Taipei’s finest Marcus Aurelius(3XChamp), CAP of Stereo:types(Prince of Darkness), The Sofa Kings(the NKOTB of Taipei), Digit(Digit Music Group) and the dirty south’s turntable don, Dan 2Hands(RapNerds). We’ll be switching the line up every month, so be prepared to enjoy yo’ self! We’ll also have some special treats for those who come out in high heels and high tops and of course come check the blog for updates on upcoming parties and pics. Strictly for the ladies Wednesdays – posts with our female readers in mind. We’re sensitive internet thugs. All Access Fridays – music videos and info about where to party for the weekend, if its not our party. We hope you enjoy it. Check in hourly, daily or weekly and feel free to leave comments and tell a friend.